This section describes the operation of four popular engine management systems ( EMS)-Bosch, Caterpillar, Ford Power Stroke, and Detroit Diesel. The workings of the onboard computer, electronic injectors, and other key components are discussed, together with basic troubleshooting and some repair procedures. But readers should understand that this material is merely an introduction to these complex systems and that it does not substitute for factory documentation and training. Since the 1960s, engineers realized that an updated common-rail system, using computer-controlled injectors and ultra-high fuel pressures, offered revolutionary possibilities for the diesel engine. As shown in FIG. 1, the modern c-r system employs a remote pump to pressurize a fuel rail, which functions both as a reservoir and as an accumulator. The rail expands to dampen pump pressure peaks and contracts to stabilize pressure when the injectors open. Since rail pressure is almost constant, fuel can be injected at will, independent of pump plunger movement. When coupled with split shot electronic injectors, fuel delivery begins early during compression stroke and can be initiated after combustion to light-off carburized particulate traps. In other words, common-rail was an enabling technology for electronic fuel injection. Two Nippon Denso engineers-Shokei Itoh and Mashiko Miyaki-were responsible for the first commercial version of the system, which appeared on 1995-model Hino Rising Ranger trucks. Meanwhile Fiat and its subsidiary Magneti Marelli Power Trains were working on c-r for passenger cars and light trucks. By the late 1990s, the prototype was turned over to Robert Bosch GmbH for production. The first generation 1350-bar (1 bar _ 14.51 psi) Bosch c-r system made its debut in 1997 on Alfa Romeo and Mercedes-Benz high-speed touring cars. • 1999-First generation, truck 1480-bar system (Renault). • 2001-Second generation, passenger-car 1600-bar system (Volvo and BMW). • 2002-Second generation, truck 1600-bar system (MAN). • 2003-Third generation, passenger-car 1600-bar system (Audi V-6). Piezo injectors reduced emissions by 20%, boosted power 5%, reduced fuel consumption 3%, and engine noise by 3 dB(A). • 2006-Fourth generation under development with higher pressures and revised injector geometry. Since the common rail is not protected by patent (low-pressure versions have been around since the 1920s), the technology has become nearly universal for auto motive and light truck engines, manufactured by companies as diverse as Hyundai, Cummins, and Mercedes-Benz. Nor is c-r limited to automotive applications: L'Orange GmbH has prototyped a c-r upgrade for marine engines with cylinder bores as large as 500 mm, and Cummins will soon release a common-rail kit for retrofit to locomotives. FIG. 2 is a schematic of a multi-hole, solenoid-operated injector of the type used on common-rail systems. The upper end of the spring-loaded needle is flat and the large-diameter lower end is shouldered. Hydraulic pressure applied to the flat tends to push the needle down, while pressure bearing against the shoulder would raise it. Movement depends upon the balance of pressures acting on these surfaces and upon spring tension. A ball-type spill valve stands between high-pressure fuel from the rail and the low-pressure circuit that returns fuel to the tank. When at rest, the solenoid is not energized and the armature spring holds the ball valve closed. No fuel flows to the tank, but both needle working surfaces see the same high pressure. The forces generated-lift from the shoulder and down-force from the flattened top-neutralize each other and spring tension keeps the needle seated. When the solenoid is energized, the armature retracts and the ball valve opens to the low-pressure return line. Because the orifice is quite small, most of the pres sure drop is confined to the area above the valve. Pressure in the nozzle cavity remains high. This pressure lifts the needle to commence injection. When de energized, the solenoid closes the ball valve, pressures equalize and the spring forces the needle down to end injection. Even though hydraulics do the heavy work, solenoids require large amounts of electric power. To overcome armature inertia, the drag of heavy fuel, and other operating variables, Bosch solenoids receive a 50V, 20A jolt during the opening phase. Once the armature is retracted, battery voltage holds it in place. FIG. 2 Bosch electronic injector initiates injection with ball-type spill valve, just visible below the solenoid in the drawing. Suspect injectors must be farmed out to specialists for cleaning, repair, and re calibration. Piezo injectors evolved from the flow-control technology developed by Siemens VDO for ink jet printers. Piezo crystals expand when excited by voltage and, conversely, generate voltage when compressed. The latter feature is used in cigarette and barbecue-pit lighters. The growth of piezo crystals under voltage is miniscule: a single wafer 80 µm thick elongates about 0.1 µm at 160V. Siemens stacks the wafers to produce a stroke of about 40 µm that is hydraulically amplified to unseat the spill valve. The wafer pack responds within 80 milliseconds of excitation, or three times faster than the best solenoids, and with an actuation delay an order of magnitude faster. As a result, injection can be divided into as many as seven precisely metered shots, each accurate to within less than a milligram of fuel. This translates into 3% more power and 15% better fuel economy than solenoids offer, and the ability to meet Euro 4 standards without particulate traps. These injectors run on the same high-pressure regime as solenoid types: piezo actuated common-rail injectors, like the one shown in FIG. 3, see peak pressures of around 1600 bar, a figure that will be increased to 2000 bar in the next generation. Piezo unit injectors develop pressures in excess of 2000 bar. Depending upon the application, injector tips have as many as 10 orifices with diameters of less than 0.1 mm. To date Siemens has built more than 15 million c-r injectors, used on upscale vehicles such as the Audi, Mercedes, Land Rover, Jaguar, and the 2007 Mercedes E320, which will introduce the technology to the North American market. Siemens also manufactures piezo unit injectors for VW and International. The latter operation is based in Blythewood, South Carolina, with all production going to the American diesel maker. Solenoid injectors from Bosch, Denso, and Delphi continue to find buyers since they cost half as much as the Siemens version and meet current emission standards. Most observers believe that solenoids will hold their market share among low-end car makers until 2010 when Euro 5 standards come into effect. FIG. 3 shows a piezo injector in cutaway view. Wafer expansion opens a servo valve that stands between the high-pressure fuel delivery circuit and the low pressure return. With the valve open, pressure above the needle diminishes, while pressure in the nozzle cavity remains nearly constant. The differential unseats the needle to initiate injection. Because wafer expansion is so miniscule, a hydraulic coupler is used to extend the stroke. The coupler also functions like a hydraulic valve lifter to compensate for lash caused by thermal expansion. While injectors are routinely replaced in the field, it should be noted that each injector is marked with a code, showing where it falls within production tolerances. For best performance, the code must be inputted into the EMS with a factory supplied scan tool. While common rail is standard on most European auto and light-truck engines, Volkswagen remains committed to electronic unit injection. FIG. 4 illustrates the Bosch unit injector of the type currently used by VW and its SEAT and Skoda affiliates. A solenoid-actuated valve controls injector timing and duration, which of course, must occur during periods when the UI is pressurized by the camshaft. 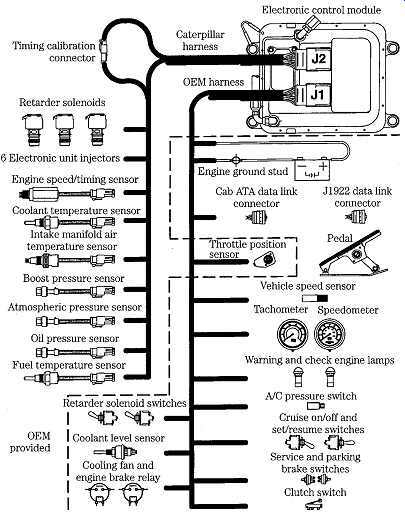 Caterpillar and Detroit Diesel developed their own versions of electronic unit injectors (EUIs) described below. In summary, computer-controlled c-r and unit-injector (UI) systems came about because of the need to reduce exhaust emissions by providing more precise control over fueling. Secondary effects are higher power outputs, more flexible torque curves, and better fuel economy. FIG. 5 An analog signal varies continuously over time, as shown in drawing A. The digital signals in B and C have only two values-"on" (full voltage) and "off" (zero voltage). Engine management systems communicate through voltage changes that take an analog or digital form. Analog signals fluctuate over time, as shown by the waveform voltage in FIG. 5. The instantaneous value-the value of the signal at any moment in time-conveys data. Voltage spikes, bad grounds, and loose connections seriously com promise the ability of analog circuits to act as reliable messengers. Even so, most sensors are analog devices that respond to changes in pressure, temperature, or fluid level by varying their internal resistance. Supply voltage is constant (normally 5V +/- 0.5V), and output voltage changes as sensor resistance increases or diminishes. In order to process the analog data, the computer converts these voltages into digital form. Digital signals have only two states-"on" corresponding to 1, and "off," corresponding to 0. All the computer need do is to discriminate between binary on and off states, or bits. Depending upon the system, a string of 8, 16, or 32 bits make up a word, which conveys information. Circuit noise can destroy part of a word, making it unintelligible, but noise generally does not alter the meaning of complete words in the systematic fashion required to fool the computer. A digital signal can also communicate data by means of pulse width modulation (PWM). As illustrated in FIG. 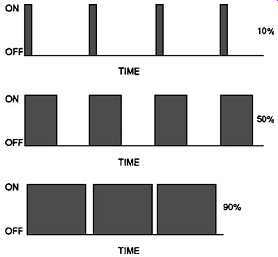 6, the width of the signal represents its duration expressed as the ratio of the percentage of "on time" divided by the percentage of "off-time." The most common application of PWM is for throttle position sensors that typically generate a pulse width of 15-20% at idle and 90% or more at full throttle. FIG. 6 Pulse width modulation varies signal on-time with changes in the quality measured. Caterpillar Inc.
A controller area network (CAN) employs a single line, or bus, to convey data to all components that make up the network. Individual components-computers, sensors, display panels, stepper motors, and other devices-respond only to those signals addressed to them. These components, or stations, still need power lines, but one signal line suffices for all. Multiplexing is not too different than old-fashioned telephone systems that rang every phone on the line. By counting the number of rings, you knew who should pick up the receiver. To make production changes easier, message content, rather than the name of the intended receiving station, functions as the address. This enables new stations to be added without modifying the transmitters. An 11- or 29-bit word prefaced to each data packet identifies message content. Thus, engine-speed data will be received by all stations, but will be of interest only to the computer and the operator display panel. Upon acceptance of a message, the receiving station scans it for errors and acknowledges receipt. Transmission speed ranges between 125 kb (1 kb _ 1000 bits/ second) and 1Mb. Messages whose content changes frequently, such as the voltage drop that signals injector opening, have priority over routine traffic. The CAN protocol has fairly wide use for automotive and truck applications, and will, experts say, become universal within the next decade. The computer that oversees engine functions goes under various names--electronic or engine control unit (ECU), power train control module (PCM), or micro controller. We'll follow the example of Caterpillar and Detroit Diesel and call the computer an electronic control module (ECM). FIG. 7 The basic ECM (electronic control module or onboard computer) in block diagram. 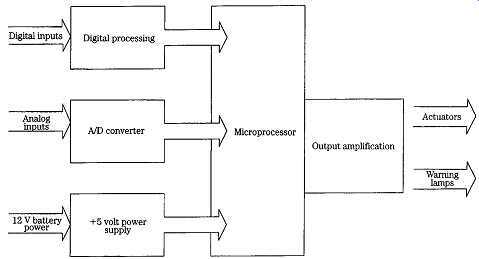 The central processing unit or microprocessor (CPU) chip contains millions of tiny transistors that integrate sensor data and operator commands to generate the out puts necessary to control the engine ( FIG. 7). The CPU performs arithmetic calculations, makes decisions on the basis of algebraic logic, and consults data held in memory. Data usually takes the form of maps, which plot changes in one parameter against two others. For example, injection timing is plotted against engine load and rpm. The CPU could calculate the required timing from sensor inputs, but it's faster to look up the answer on a map. Transient data, such as ambient air temperature and fuel pressure that can be for gotten when the engine is shut down, are stored in random access memory (RAM rep resented diagrammatically in FIG. 8). Upon restarting, RAM collects new data, updated hundreds of times a second. Operating instructions, diagnostic routines, and other constants reside in read-only memory (ROM), where they remain as if chiseled in stone. Flash memory is a semi-permanent repository that, like a Swiss bank account, requires a closely held password for access. Manufacturers use flash to adapt standard ECMs to various engine families, each of which has unique operating parameters. Factory technicians, armed with the correct password, can "re-flash" this type of memory with updated programs and patches to correct the bugs that invariably appear in service. The Motorola 6800, a pioneer 8-bit microprocessor found in early Caterpillar systems and in millions of GMC automobiles, had 160 kb of flash memory and 32 kb of RAM. The 32-bit Adem 2000, now specified by Cat, has 256 kb of RAM and 1 Mb of flash. The Motorola MPC 500, currently specified by Magneti Marelli Power Trains for automotive applications, has similar capabilities. FIG. 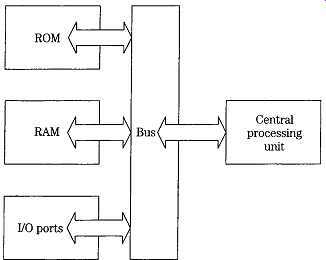 8 The central processing unit carries on an internal conversation with its several types of memory and communicates with the external world through input/output ports. In order to interact with the external world, the CPU requires peripherals, such as a converter to translate analog signals from temperature and pressure sensors into digital format. Driver circuits, often working through relays, provide the amperage for electronic injectors, fan motors, turbo waste-gates, and other current-hungry actuators. One or more timers, controlled by oscillating crystals, give the CPU the precise time reference necessary to orchestrate injection timing and duration relative to inputs from the camshaft position sensor. Computer capabilities evolve faster than the hardware: the MPC5500, released in 2003, can actuate electronic intake and exhaust valves, vary camshaft timing and control electro-mechanical braking, when these features become available. • Temperature-ambient, coolant, intake air, fuel, and exhaust (upstream and/or downstream of turbo). Most of these sensors are negative tempera ture coefficient types, which lose internal resistance as temperature increases. Coolant and exhaust temperature sensor elements collect deposits that should be periodically removed. • Pressure-atmospheric, fuel, turbo boost, crankcase, exhaust, and com pressed air (for heavy trucks). Exhaust-gas pressure sensors monitor pres sure drops across particulate traps. • Position-rack, idle mode, variable-geometry turbocharging (VGT) control, turbo waste-gate, back-pressure, and exhaust gas recirculation (EGR) valves. These sensors generally take the form of a switch or variable resistor. • Mass air flow entering the manifold. • Oxygen content in exhaust gas. • Velocity-crankshaft rpm, road speed and, for some applications, turbo rpm. A coil responds to shifts in the magnetic field by generating a small signal voltage. Gear teeth are convenient markers. 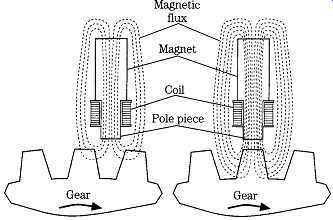 These circuits may also respond to a magnetic disturbance caused by a tdc reference in the form of a modified gear tooth or a permanent magnet on the rim of the gear. Dynalco Controls, a unit of Main Controls Corp.
One-off EM systems, custom-built for existing installations, often retain the mechanical governor as a way to reduce costs. Production systems incorporate electronic governing, whose operation is controlled by the computer in concert with a magnetic engine-speed sensor. The ECM also uses speed-sensor data to calculate injector pulse width. FIG. 9 illustrates sensor operation, which uses gear teeth as markers. Some speed sensors pick up the rpm signal from a single gear tooth, which has a distinctive shape and magnetic signature. In addition, a Hall-effect sensor, triggered by slit on the camshaft gear, generates a timing reference and, in some applications, reports engine speed. Failure of the camshaft position sensor shuts the engine down, often without warning. Bosch systems have a fail-safe feature that enables the computer to calculate timing from the crankshaft speed sensor when the primary reference is lost. The engine will continue to run, but starting may be more difficult. For some Cat models, either sensor can stand in for the other. As mentioned earlier, accelerator position is reported as changes in the band width (duration of voltage) generated by the throttle position sensor (TPS). These sensors are not without problems, and Bosch again comes to the rescue by providing a second, backup throttle position sensor. 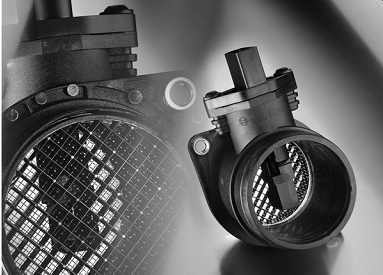 A mass air flow (MAF) sensor measures the volume of air entering the engine as a function of its cooling effect on a heated film or a platinum wire ( FIG. 10). Supporting electronics measure how much current is needed to maintain the film at target temperature, which is about 75° F above ambient. As engine speed and air flow increase, correspondingly more current is needed. Current draw appears as an analog output voltage of between 0 and 5V. MAF sensors lose accuracy when contaminated and can be ruined by rough handling. One would imagine that the computer, capable of several hundreds of thou sands operations a second, would exert absolute control over the engine. But things get out of hand in ways the computer cannot predict. For example, fuel quality varies with each fill-up, injector nozzles wear unevenly, humid air exerts a greater cooling effect on MAF sensors than dry air. These and a hundred other variables affect combustion efficiency. The O2, or lambda, sensor closes the control loop by monitoring the level of oxygen in the exhaust gases. Unlike other sensors, the platinum-coated zirconium-oxide O2 sensor generates its own voltage. Once it reaches operating temperature (approximately 700_C), the sensor develops nearly 0.7V in fuel-rich environments. As less fuel is burned and the oxygen content of the exhaust approaches that of the atmosphere, sensor voltage drops off to nearly zero. Signal voltage exhibits a sawtooth pattern. Normally, the computer uses this data, in conjunction with air-flow data, to deliver no more fuel than needed for combustion. Under load, the computer relaxes its standards a bit, richening the mixture for more torque. The O2 sensor then functions as a smoke limiter. The sensor also influences the amount of exhaust gas recirculated into the combustion chambers. Inline engines have an O2 sensor threaded into the exhaust manifold at Y, where temperatures are high and exhaust gases are representative of all cylinders. V-type engines replicate the arrangement for each bank. An electrically heated four wire (two wires to ground, one carrying signal voltage and the other battery voltage to the heater) O2 sensor will also be installed downstream of the catalytic converter. This sensor monitors converter efficiency and has no effect upon mixture strength. OBD-2 sensors are good for 100,000 miles, although response slows with age and contamination. In event of malfunction, the EMS can disregard the O2 sensors and enter into open-loop operation. Working without the benefit of feedback, the computer adjusts fuel delivery to programmed values. Open-loop operation is, with good reason, called the "limp-home" mode. Sensors provide data to the ECM and actuators carry out the computer's commands. The primary actuators are the electronic injectors, part and parcel of any EMS. Another almost universal type of actuator is the electronic governor. FIG. 11 sketches the "drive-by-wire" governor used on the Deere 7L 6076 H. A switch on the electronic control module enables the operator to select any of three speed-control programs-true all-speed governing (as used in vehicles), min-max governing (for generator applications), and full-power boost. The latter option has a timer associated with it to prevent engine damage. Other actuators control fuel pressure, turbo boost and, in some applications, exhaust back pressure. FIG. 11 "Drive-by-wire" throttle control used on some Deere engines. Negotiating one's way around computerized engines requires an investment in special tools. A basic troubleshooting technique is to listen in on the "conversation" between the ECM and its array of sensors and actuators. The ECM has some degree of diagnostic capability, in that it reacts to abnormal sensor and actuator behavior by generating trouble codes. These codes are the starting points for all diagnostic work. Fault codes can be retrieved by counting the blinks made by the check engine lamp and looking up what the numbers mean. By law, motor vehicles sold in the United States must have their fault codes published on the Internet. (Try to find them.) It’s much simpler to use a scanner that reads off codes directly and, depending upon how much you are willing to pay, retrieves codes that have been erased, shows raw sensor data going into the computer, energizes actuators, and reports pulse-width percentages. Readers who simply want to stay current with the status of their vehicle can make do with an inexpensive scanner that reads active trouble codes and erases them with the push of a button. While scanner-to-engine connections are standardized, the standards vary. OBD-2 (On-Board Diagnostics, 2nd generation) has been mandated for autos and light trucks sold in this country since the early 1990s. Protocols vary with the manufacturer. For example, we have PWM (Ford), VPW (General Motors), and ISO 9141 (Chrysler, European, Asian) and a scattering of Keyword 2000, aka ISO 14230. Diesel makers often specify SAE J 1587. The Bosch CAN protocol has become increasingly popular and, according to industry watchers, may become universal after 2008. The scanner must be compatible with the protocol of the engine under test. Factory technicians have a decisive advantage in diagnostic tooling. Testers such as the Bosch KTS 650, Caterpillar Electronic Analyzer and Programmer, and Ford NGS (New Generation Star) were developed in tandem with the systems they monitor and often by the same personnel. These tools translate trouble codes, display raw sensor data, have limited reflash (reprogramming) capability, cycle injectors and other actuators, and display operating parameters a few seconds before and after a fault has been flagged. All report injector band width. The Ford NGS tool includes a buzz test for HEUI injectors, which while not definitive, is helpful. In addition, Hartridge and other European firms supply an array of bench test and calibration equipment. As far as they go, the troubleshooting procedures described in Section 4 apply to computerized engines. For example, blue- or blue-gray smoke means lube oil is being burned. Oil can enter the chambers by way of faulty valve or turbo seals, or past worn piston rings. EMC-equipped engines may have additional sources of oil intrusion, such as HEUI injector seals. The first step in troubleshooting is to interview the operator to obtain as much information as possible about the complaint that might have nothing to do with the engine. For example, a truck driver's technique (or lack of it), vehicle efficiency, or operating conditions (such as weather, loads, and fuel) can have serious effects upon engine performance and fuel economy. Custom-built fixed and marine installations require careful scrutiny to make sure they have been designed properly. Once the problem has been narrowed down to the engine, walk around the unit looking for anything amiss, with emphasis on the cooling, air inlet, exhaust, and fuel systems. TBL. 1 is a generalized troubleshooting guide. More specific procedures are provided in the sections that deal with Caterpillar and Ford systems. CAUTION: Don’t disconnect or make up harness connectors or actuators while the engine is running or with the ignition key "on." The resulting voltage spikes can damage the computer. Low-pressure fuel circuits should be tested for transfer-pump pressure, air leaks, and restrictions as described in Section 4 and in more detail in this section. High-pressure fuel circuits take us into the realm of diagnostic trouble codes (DTCs) and highly specific repair procedures for which engine manufacturers issue multi-volume service manuals. But while no serious repair effort should be contemplated without this documentation, certain generalizations can be made. • Harness connectors. Look for misaligned or loose connector pins, and for evidence of overheating. Wiggling the harness can sometimes reveal loose pin connections that generate transient faults in service. Arrange harness clamps to provide slack at the connectors. 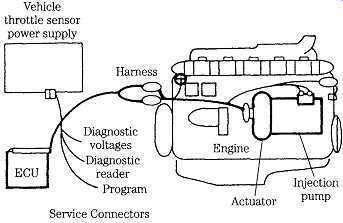 • Sensors and sensor wiring. Most sensors have three leads-voltage input, voltage output, and ground. Determine that voltage is present (which means that the input circuit is probably okay) and that the output is neither shorted to ground nor open. Bad grounds, that is, loose tie-downs, rust, paint, or grease on the chassis or engine ground studs-can affect any circuit and generate noise that is fatal for band-width signals. If the circuitry is functional, the problem lies with the sensor that, in the absence of factory documentation, should be tested by substitution of a known good one. The camshaft position sensor has been a chronic problem on some engines, the throttle-position sensor on others. • Actuators that live in bad environments. Exhaust recirculation valves (EGR) carbon over and stick, the exhaust back-pressure valve on Power Stroke exhaust systems rusts and binds, injectors malfunction, and glow-plug control modules sometimes melt. WARNING: Don’t disconnect, test, or otherwise disturb injector wiring while the engine is running. Voltages are hazardous. • Damage caused by contaminated fuel, off-road excursions, "high performance" air filters and so on. High-pressure components-computer-controlled injector pumps, fuel-pressure regulators and electronic injectors-do not lend themselves to field repair. Repairs must be accomplished by professionals equipped with the necessary test and calibration tooling. Denso has invested millions to upgrade its factory repair centers with Hartridge AVM2PC test benches. Less expensive components-sensors, EGR valves, and control modules-are sacrificial items, discarded when they fail. CAUTION: The speed of a diesel engine is entirely a function of fuel delivery. A mistake made when servicing the fuel system can result in a runaway engine. Caterpillar suggests that a helper stands by ready to block the air intake with a steel plate the first time the engine is started. The helper must be careful not to allow his fingers to be caught between the plate and the intake-manifold flange, especially if the engine is turbocharged. Scan active and past trouble codes, and make the necessary repairs. Look for evidence of water, macrobiotic growth, and solids. Test with a hydrometer. No. 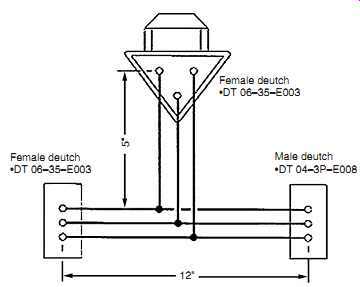 2 diesel should have a specific gravity (S.G.) of 0.840 or higher. Use of No. 1 diesel can cut power by as much as 7%. Mixing Nos. 1 and 2, a common practice in cold climates, costs a proportional amount of power. Make sure the valve opens fully. Although fuel temperature varies with the application, 85°F is a reasonable figure. Every 10° increase in temperature above 100°F cuts power by 1%. Restrictions -crimped lines, clogged filters, sharp bends-increase pumping loads and heat. Verify that the fuel heater functions normally. Change fuel filters. Look for restrictions at points where fuel flow is disturbed with particular attention to the water separator, check valves, and flow meter. Examine the lines for physical damage. A clogged vent causes the tank to develop vacuum as fuel is consumed. Check for fuel leaks, which occur most often on the high-pressure side of the system. Air usually enters on the suction side of the transfer pump. Look for bubbles in the injector return line and in the filter-to-injector pump line. A rubbing turbo wheel, bent blades, oil leaks, or failure of the VGT to function properly reduce turbo boost. Potential leak sites include the exhaust plumbing to the turbo and, on the outlet side, the intake manifold-gasket and aftercooler. Replace the air filter unless obviously new. Excessive turbo boost with normal fuel delivery indicates retarded injector timing, which works against the additional boost to reduce power, increase fuel consumption, and raise exhaust temperatures. These high temperatures accelerate exhaust-valve and turbocharger failure. Consult the shop manual to determine the permissible charge-air temperature. In normal operation, an efficient aftercooler should hold the temperature rise to no more than 30°F over ambient. Maximum temperatures, as generated during full-throttle dyno tests of turbocharged engines, should be about 325°F without an aftercooler, 245°F with a jacket-water aftercooler, and 150°F with an ambient air cooler. Check injector-pump timing against manufacturer's specs with a dial indicator as described in Section 4. Locate weak or misfiring cylinders by shutting down one injector at a time with the appropriate factory tool while the engine is running. Replace the associated injector(s). If that does not restore cylinder function, make a compression test as described in Section 4. Refer to manufacturer's manual for test procedures. Remove carbon deposits from valve and manifold inlet porting. Check turbo pressure control and monitoring devices. Check exhaust piping for damage; verify back pressure against manufacturer's specs. Exhaust back pressure readings of more than 27 in./H2O for turbocharged engines or 34 in./H2O for naturally aspirated engines are cause for concern. Check for high current draws, air leaks in compressed-systems, and other parasitic loads that reduce engine power output. Look for damage to factory-sealed adjustments that, For example, can indicate that governed idle speed has been increased in an attempt to boost full-throttle power output. Using an accurate tachometer (not the control-panel unit), compare idle speed against the factory specification. FIG. 12 illustrates the EMS used on Caterpillar 3116, 3176, 3406E, and 3500 engines. It’s a relatively simple system, without the bells and whistles mandated by current emissions regulations. The ECM mounts on the engine, which reduces the electromagnetic radiation given off by the harness, simplifies packaging, and enables the computer to be cooled by fuel. A major engineering effort was required to isolate the electronics from the heat, vibration, solvents, steam, and water blasts that engines are exposed to. FIG. 12 3406E Cat engine management system in block diagram. FIG. 13 C-10, C-12, and C-15 engine management system. Caterpillar Inc.
All sensors, with the exception of the oil pressure sensor, input data for efficient fuel allocation. Abnormally low or high sensor readings cause the ECM to set one or more trouble codes, which can be retrieved by connecting a scan tool to the SAE J1922 data link connector. The only computer-controlled actuators in this particular system are the electronic unit injectors (EUIs), cooling fan, and cruise control. 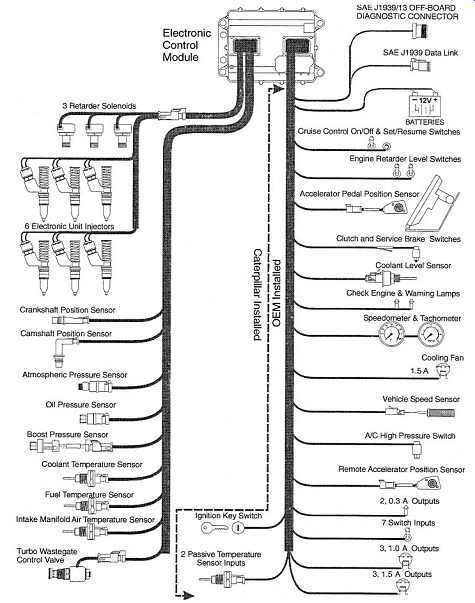 A more sophisticated system used on current C-10, C-12, and C-15 truck engines is illustrated in FIG. 13. Sensor and actuator functions for this and the earlier Cat system are outlined in TBL. 2. FIG. 14 shows the location of EMS components on the C-10 and C-12 engines. 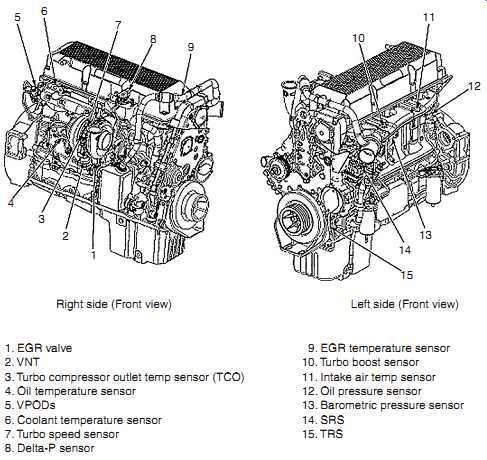 Sensor location is similar for the C-15, except that boost and intake-manifold pressure sensors are on the left side forward rather than on the right. Unit injector with injection timing and volume controlled by a solenoid slaved to the ECM. Absolute pressure sensor measuring pressure from 0-16.8 psi. 0-165 psi. Data communicated to service tools is absolute pressure less atmospheric pressure. Thermistor not requiring an external voltage supply. Used to monitor engine operation during cold starts and to reduce power output when coolant temperature is excessive. Thermistor not requiring an external voltage source. Provides data for control of the inlet air heater, cold idle, and cooling fan. Used to adjust fuel delivery and to limit engine power when fuel temperatures exceed 86°F (30°C). Maximum power reduction occurs at 178°F (70°C). Higher fuel temperatures flag a trouble code. Report engine rpm and timing data for fuel injection. Normally, the ECM monitors both the camshaft and crankshaft position sensors during cranking and the crankshaft sensor while running. If either sensor fails, the engine will start and run using data supplied by the other. A solenoid that regulates turbo boost. Both the 3100-3500 and C series engines employ EUIs that combine mechanical actuation with electronic control over fuel volume. FIG. 15 illustrates an EUI in cross-section. A roller-tipped rocker arm, acting on in the injector plunger, provides the force necessary to generate the 28,000-psi injection pressure. 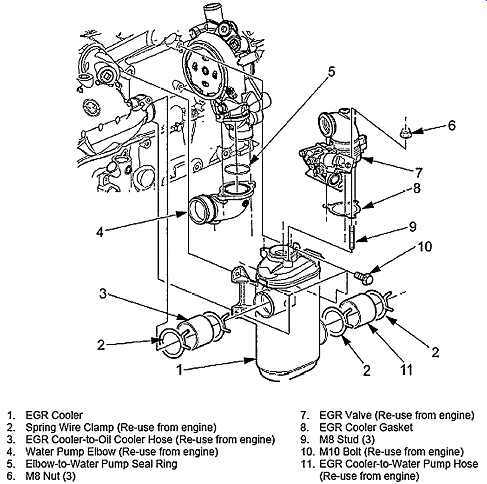 The solenoid valve, shown on the left of the drawing, opens the spill/fill port to admit fuel into the injector barrel during the period of plunger retraction. A spring-loaded check valve, located near the injector tip and set to open at 5000 psi, remains closed during the fill process. Injection can be initiated any time after the plunger starts its downward travel. But until the ECM signals the solenoid valve to close the spill/fill port, fuel merely cycles through the EUIs as a coolant and as a purge to remove any entrapped air. Upon signal, the solenoid valve closes the port, trapping fuel in the injector barrel. Further downward movement of the plunger raises fuel pressure sufficiently to over come spring tension acting on the check valve. The check valve opens and injection begins. FIG. 14 EMS component location, C-10 and C-12 Caterpillar engines. Left-side view (A) and right-side and top view (B). Caterpillar Inc.
Injection continues until the ECM signals the solenoid to open the spill/fill port. Responding to the sudden loss of pressure at the injector tip, the check valve snaps shut. Injection ceases. The plunger continues its downward stroke, displacing fuel through the open spill/fill port and into the fuel-return gallery. Although the software has primary responsibility for injector timing, plunger movement is affected by rocker-arm lash. The onset of pressure rise depends upon the clearance between the rocker arm and the plunger. A Caterpillar PN J 35637 height gauge is used to establish this critical variable ( FIG. 16). FIG. 15 EUI in cross-section. 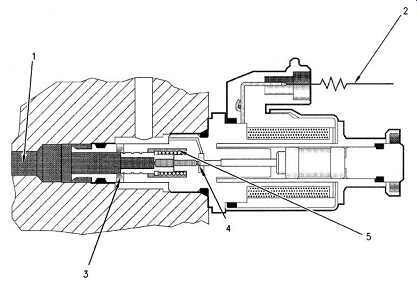 The injector is a hybrid, with electronic control of injector timing and duration, and mechanical actuation. FIG. 16 Caterpillar-supplied height gauge should be used to position EUI injectors relative to the camshaft. FIG. 17 EUI fuel system consists of fuel line (1), fuel-supply gallery integral with cylinder head (2), EUIs (3), fuel-return gallery (4), fuel-cooled ECM (5), filter (6), manual priming pump (7), distribution block (8), transfer pump (9), pressure regulating valve (10), check valve (11), fuel tank (12), and drain plug (13). Caterpillar Inc. FIG. 17 illustrates the low pressure circuit for EUI-equipped engines. A gear-type transfer pump (9) delivers fuel from the tank (12) to the injectors (3). The pump incorporates a check valve (11) that permits fuel to flow around it during manual priming and a pressure-relief valve (10) to protect the system from over-pressurization. Cat supplies dealer mechanics with a special tool, consisting of a pressure gauge, a sight glass, and the necessary fittings for makeup to mechanical and electronic low pressure systems. This tool is similar to the Ford tool described in Section 4. Check fuel pressure by removing the fuel pressure sensor at the base of the fuel filter. Install a pressure gauge and run the engine at rated rpm and load. Pressure should be 90 psi. If pressure is 75 psi or lower, check the fuel level in the tank, verify that the fuel cap vent is open, and that supply and return lines are in good condition. Pay particular attention to the return line, which can collapse if exposed to excessive heat. Replace the fuel filter. If necessary, replace the lift pump. If fuel pressure is high, that is, 100 psi or greater, remove the fuel-regulating valve (10) and make sure the orifices near the tip of the unit are open. Flush out any debris and attempt to find the source of the contamination. Check for a clogged fuel return line. Verify that the transfer-pump relief valve functions. Deactivating one EUI at a time will identify misfiring or dead cylinders. As mentioned previously, current values are high, and for your own safety, don’t tamper with EUI wiring while the engine is running. Professional-quality scanners can safely deny power to the injectors so that the effect, if any, on engine performance can be gauged. When a weak cylinder is located, replace the injector and retest. If a new injector does not solve the problem, check valve lash to make certain that the valves are seating and, if necessary, make a cylinder compression as described in Section 4. Caterpillar technicians use a boroscope, inserted through the injector mounting boss, to visually inspect cylinder internals. HEUI evolved from the EUI, and since mid-1994 has been used on Caterpillar, International T444E, DT466E, 1530E, certain Perkins models, and, most famously, on the Ford (International) Power Stroke. Unlike conventional camshaft-driven unit injectors, HEUIs are actuated by high-pressure crankcase oil. Since injection is no longer tied to camshaft motion, fuel can be injected at any crank angle. At higher-than-idle speeds, injector pressure is independent of engine rpm and can attain values of 30,000 psi. FIG. 18 illustrates the general layout of the Cat system that differs only in detail from Ford and other HEUI applications. FIG. 19 shows the arrangement of the piping for the 3126B truck engine, which is the focus of this discussion. The high-pressure oil pump delivers crankcase oil to the injectors at cranking pressures of 500 psi that increase to as much as 3300 psi under speed and load. The computer-controlled injector actuation pressure control valve (IAPCV) regulates oil pressure by shunting pump output to the crankcase. Fuel pressure is regulated to 55 psi minimum. HEUI consists of five major components-a solenoid, poppet valve, mushroom shaped intensifier piston, barrel, and a seven-hole nozzle assembly ( FIG. 20). Approximately 4A is required to energize the solenoid and 1.5A holds it open. Upon command, the solenoid opens the poppet valve to admit high-pressure lube oil to the upper end of the intensifier piston (6 in FIG. 20). The oil forces the piston and plunger (7) down against fuel trapped in the injector body by a ball check valve. The fuel end of the plunger is smaller in diameter than the upper, or oil, end. The difference in cross-sectional area multiplies the hydraulic force acting on the fuel 7.5 times, to produce injection pressures of 3000-30,000 psi. Pressurized fuel lifts a second check valve, enters the cavity on the lower right of the drawing, and reacts against the needle shoulder to overcome spring tension. Nozzle-opening pressure (NOP) varies with the application. Some Cat injectors have an NOP of 4500 psi. Rebuilders of Power Stroke HEUIs look for 2750 +/_ 75 psi. Note that both band width (the time the injector is open) and actuator-oil pres sure determine the amount of fuel delivery. HEUI injectors have undergone constant refinement. The most significant change is the split-shot PRIME (pre-injection metering) version that first appeared on 1994 California Ford F series trucks and has since become almost universal. These injectors work like other HEUIs, except that the plunger incorporates a radial groove that receives fuel through six bleed ports drilled in the face of the plunger. As the piston moves downward, the groove aligns with a spill port in the barrel, shunting pressure. The output-side check ball seats and injection stops. Further piston movement masks the port and injection resumes. FIG. 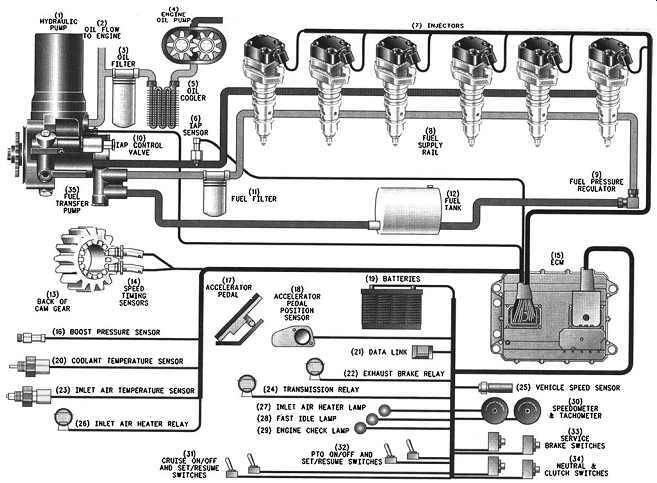 18 HEUI schematic for the Caterpillar 3126B truck engine is broadly similar to International, Ford, and Perkins applications. The three external o-rings are critical. The upper o-ring, now supplied with steel and elastomer backup rings, prevents lube oil from leaking up and out of the injector body. The middle o-ring and its supporting rings prevents lube oil from mixing with the fuel. Sudden and dramatic increases in oil consumption can usually be attributed to failure of this middle ring assembly. The lower o-ring keeps fuel from puddling around the base of the injector. Lubricate o-rings and wait ten minutes or so for the rings to assume their natural shape before installing injectors or other parts sealed by o-rings. Failure to do so can result in leaks. Seals on all plumbing, especially the fuel-return lines, are critical. Don’t disturb connections without new seals in hand. Injector failure is not always easy to diagnose, since rough idle, long cranking periods, and misfires at particular rpm's can have multiple causes, several associated with the high-pressure lube oil system. This subject is explored in more detail in the con text of Power Stroke systems. It can be helpful to check individual exhaust runner temperatures with an infrared thermometer. All exhaust-manifold runners should be at or very close to the same temperature: a hotter-than-average runner indicates the associated cylinder is receiving too much fuel, and a cool runner means insufficient fuel. Both of these conditions point to injector failure. HEUI injectors are not field repairable in the sense that the average mechanic can do the work. Rebuilt units are available from factory and independent suppliers such as Dipaco. FIG. 19 HEUI plumbing incorporates drilled galleries in the cylinder head for fuel delivery and return, tubing between engine components, and hoses. Major components as shown for the Cat 3126B engine are fuel filter to fuel-supply passage (1), lift pump to filter (2), pressure regulator (3), tank return line (4) fuel-filter inlet for the lift pump (5), filter (6) and fuel supply line (7). FIG. 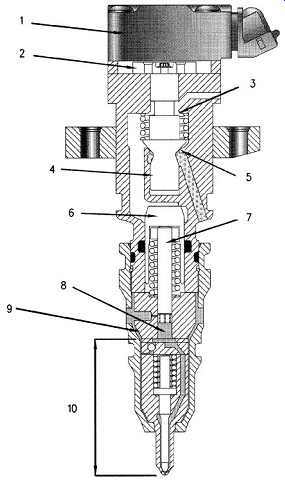 20 HEUI injector in cross-section, with solenoid (1), armature (2), upper poppet seat (3), poppet valve (4), lower poppet seat (5), intensifier piston (6), plunger (7), plunger cavity (8), barrel (9), and nozzle assembly (10). Force multiplication occurs between the oil and fuel ends of the intensifier piston. Caterpillar Inc. FIG. 21 The injector actuator pressure control valve (IAPCV) regulates pressure by shunting oil from the pump discharge back to the sump. Outlet flow to injectors is shown at 1, return flow at 5. 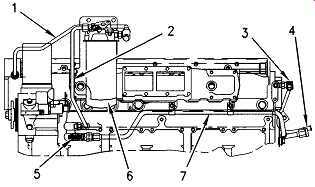 In this drawing the solenoid is energized, opening the poppet valve (4) to divert a portion of pump output back to the crankcase (5) through the drain port (3). Flow to the injectors exits on the left (1). Caterpillar Inc.
A seven-piston swash-plate pump, located forward on the left side of the 3126B engine, supplies oil pressure to the injectors through a passage in the engine cylinder head. Oil returns to the sump through ports under the valve cover. The pump, also used by Ford and International, is non-rebuildable. 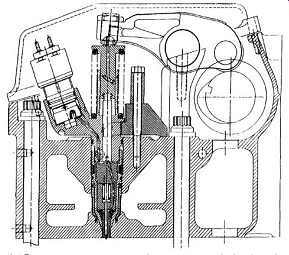 The injector actuation pressure control valve (IAPCV), mounted aft of the pump, regulates oil pressure ( FIG. 21). The poppet valve floats in suspension between pump-discharge pressure that tends to move it to the left and force generated by the solenoid that pushes it to the right. When the oil pressure over-balances the sole noid, the poppet valve opens to shunt a portion of pump output back to the crankcase. Pressure falls. How much force the solenoid generates depends upon the amount of current it receives. The ECM compares oil-pressure data, collected 67 times a second from a sensor mounted in the cylinder-head gallery, with desired pressure and adjusts cur rent intensity accordingly. Note that HEUI injectors in this application require 870 psi to fire, a figure that varies with ambient temperature. The engine won’t start unless firing pressure is reached. Pressure ranges between 580 psi during initial cranking to 3350 psi with 3500 psi occasionally seen. When the IAPCV fails, replacing the o-rings can sometimes save the cost of a new part. One should be very careful when servicing these valves, since wrench torque can easily distort the housing. Caterpillar supplies a special tool for this purpose, which can be described as a flair-nut crow's-foot wrench. That is, the box end of the wrench has been partially cut away so that it will slip over the valve body. Torque to 37 ft-lb. The piston-type transfer pump runs off an eccentric on the back of the injector oil pump. Nominal fuel pressure is 65 psi at the pump. When the measurement is made downstream of a new filter, expect to see a pressure drop of about 5 psi. If pressures are low, clean the inlet screen on the pump and replace the fuel pressure regulator with a known-good unit. If the problem persists, replace the transfer pump. The amount of boost relative to engine speed and load depends upon the application, with the specification given for 28.8 in./Hg dry barometric pressure, 77°F (25°C) ambient temperature, and 35 API gravity fuel. If the air is denser, that is, if barometric pressure is higher and/or temperature lower, boost pressure will be higher than specified. Likewise, a heavier fuel increases turbo output. When documentation is unavailable, consult the factory for boost specifications. The wastegate is nonadjustable. Low manifold pressure combined with high exhaust temperature suggests that the air filter is clogged or that the aftercooler, pressure-side turbo plumbing, or intake-manifold gasket leak. FIG. 22 A breakout box must be compatible with the harness connector used. Caterpillar Inc. The TPS is located under the accelerator pedal and generates a pulse-width signal that can read with a Fluke Model 97 or equivalent multimeter and a breakout box. The breakout consists of three 12-in. long No.10 AWG wires that bridge the harness connectors and three 6-in. long No. 12 AWG wires that make up to the meter. 1. Using Caterpillar PN 1U5804, crimp Deutch DT 04-3P-E008 male connectors to one end of each of the three long wires and DT 04-3P-E003 female connectors to the other ends. See FIG. 22. 2. Make up DT 04-3P-E003 female connectors to one end of each of three short wires. These connectors plug into the meter receptacle. 3. Solder the three short wires to the centers of the longer wires. Set the meter to measure pulse-width percentage and, with the ignition switch "on," depress the accelerator pedal. Pulse width varies with make and model, but should be in the neighborhood of 80-90% at wide-open throttle and drop to 10 or 20% with the pedal at rest. A spare TPS is good insurance. TBL. 3 lists the most critical DTCs for this system. PID (parameter identifier) is a two- or three-digit SAE numerical code assigned to each component. For example, 91 refers to the throttle position sensor. FMI is a failure mode identifier used to describe the kind of failure detected, and flash refers to the number of blinks the code triggers on the "check engine" lamp. Some codes are merely informational and don’t affect engine performance. Active codes, that is, those that turn on the diagnostic lamp and keep it on, mean that the problem requires immediate attention. The lamp will go out when the malfunction is repaired. Intermittent malfunctions, often caused by loose harness connectors or bad grounds, cause the lamp to blink and go out. These codes are then logged in computer memory, where they can be retrieved and erased with the appropriate scanner. Intermittent codes that are logged repeatedly need investigation. Four engines, three of them built by International, go by the name "Power Stroke." The first was the direct injection turbocharged 7.3L V-8. This engine, also known as the International T444E, powered F series trucks and E series vans between 1994 and 2003. The 32-valve 6.0L Power Stroke, or International VT 365, has been used on pickups and vans since 2004. Production of the 6.0 will end in 2007, when it will be replaced by a 6.4L V-8. The Ford V-6, aka DT17, has been used on low cab forward (LCF) trucks since 2005. In many ways, the original 7.3L Power Stroke is the most interesting of the group. It carried Ford to first place in light diesel truck sales and generated a cult following not seen since the days of the Mustang. People have taken out second mortgages on their homes to buy these trucks. The material dealing with the operation of HEUI injectors, the high-pressure oil pump, and the IAPCV also applies to the Power Stroke, although Caterpillar and Ford parts rarely interchange and pressure specifications vary. TBL. 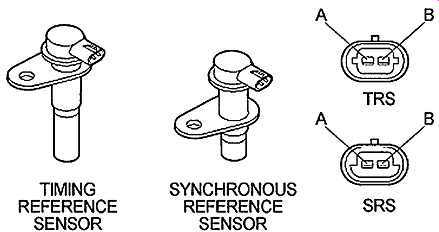 4 translates Ford acronyms and describes sensor function. "Supply" is the voltage going to the sensor; "signal" is the sensor output to the computer (ECM). Begin with a walk-around the vehicle to determine that the tank is at least a third full, batteries are charged, battery terminals are clean and secure, and the radiator is topped off. Check the crankcase and high-pressure pump reservoir oil levels. Ford requires a 15W40 oil that meets SH, CG-4, and Mack E-0L specifications, and recommends that Motorcraft 15W40 "black-lid" be used because of its resistance to aeration. The oil level should come to within one inch of the top of the pump reservoir. 4. 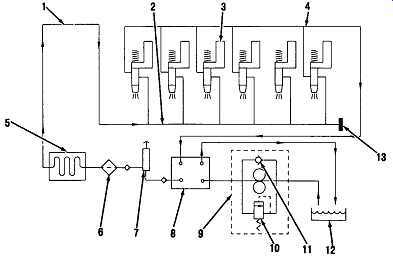 Check the glow-plug relay, which is a high-mortality item and especially so in its original oval form. The newer round-case relay interchanges with the older unit. The red cable, connected via fusible links to the starter relay, should have battery voltage at all times. If voltage is not present, check the fusible links and connections for opens. The heavy 10-gauge brown wire going to glow plugs is hot when the relay is energized. One of the 18 gauge wires (usually red with a light green tracer) is the signal wire, energized by the lube-oil temperature sensor. This wire must have battery voltage for the relay to function. Depending upon the circuit, the "wait-to start" lamp may signal when the glow plugs energize or merely count off seconds. Individual glow-plugs should have a resistance of about 0.11 to ground when cold and 21 or more after cylinder temperatures normalize. 5. Check fuel pressure while cranking for 15 seconds. If pressure is less than 50 psi, replace the fuel-filter element, remove any debris on the fuel screen and on the screen protecting the IPR deceleration orifice. See the "IPR" section for more information. 6. Check injector-oil pressure during cranking. A pressure of 500 psi must be present to enable the injectors. Expect to see 960-1180 psi at high idle and 2500+ psi during snap acceleration. If the computer senses that the IPR has malfunctioned, it holds idle oil pressure at a constant 725 psi. Trouble code 1280 means low IPR signal voltage, 1281 high signal voltage, and 1212 abnormally high (at least 1160 psi) oil pressure with engine off. See "Low oil pressure" below. 7. While cranking, check for the presence of an rpm signal. A failed CMP can hold oil pressure below the 500-psi injector-enabling threshold. 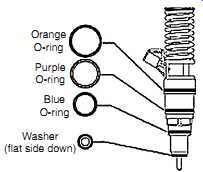 Refer to "Camshaft position sensor" section below. 8. Check power at the injector solenoids with an appropriate scan tool. Zero pulse width on all injectors means a bad CMP sensor or IDM. Failure may trip trouble code 1298. The high power levels-10A at 115 VDC-put severe demands on the injector drive module. In addition, modules on Econoline 7.3L vans built before 4-11-96 have problems with water intrusion. WARNING: Injector voltage can be lethal. Don’t disconnect or otherwise tamper with the injector wiring while the engine is running or the ignition key is "on." 3. Perform steps 1 through 9 in the preceding "Slow or no-start" section. 4. If you have access to a Ford factory tester, make a "buzz" test on the injectors, listening for differences in the sound. A bad injector often buzzes at a lower frequency than the others. 6. Test engine compression as described in Section 4. Verify that there are no leaks at the line connections, around HEUI bodies and into the fuel system. Remove the valve covers and look for cracks in the casting, caused by mis-drilled oil galleries. Small leaks can be detected by pressurizing each gallery with an injector tester or a grease gun and a 3000-psi pressure gauge. Charge the gallery with oil at 2000 psi and wait several hours for any leaks to register on the gauge. The next step in the search for causes of low oil pressure is to check the IPR (functionally similar to the Caterpillar IAPCV). If the 5V +/_ 0.5V reference signal is present and the output circuit is not shorted or open, replace the regulator o-rings with parts available from Ford International or aftermarket sources. The DF6TZ 9C977-AN Dipaco repair kit services IPRs used before and after engine SN 187099. If o-rings don’t solve the problem, the regulator should be tested by substitution of a known good unit and, if necessary, replaced. Torque to 35 ft/lb and don’t use sealant that could clog the orifice on the threaded section. Aeration often results in hard or no-starts, erratic idle, shutdowns on deceleration, and loss of rpm. CG4/SH oil helps control the problem. As originally specified, 1994-model engines held 12 quarts of crankcase oil. This specification has been revised to 14 quarts. The dipstick should be recalibrated or replaced with Ford PN F4TZ-6750-E.
• Mechanical fuel pumps (pre-1998 models)-disconnect the return line at the fuel pressure regulator on the fuel filter. Crank the engine in 15-second bursts, allowing ample time for the starter to cool and until a steady stream comes out of the line. • Electric fuel pumps-crack a vent port on each cylinder head and run the pump until air is purged. The IDM delivers a low-side signal to control the timing, duration, and sequence of injector opening. The high-side delivers 115 VDC at 10A to the HEUI solenoids. WARNING: Don’t disconnect, attempt to measure or otherwise disturb IDM circuits while the engine is running. Voltages are lethal. 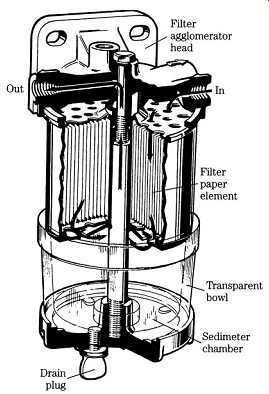 Multiple leak points-Schrader valves, bleed screws, fuel-line connections- make the filter/water separator a prime suspect. Use OEM clamps on hose connections, new seals, and dope screw threads with sealant. Surplus fuel from the injectors recycles back to the filter. The connection at the filter incorporates a check valve that closes when the engine stops. Should the check valve leak, air from the return line will be drawn into the filter as fuel in the canister cools and shrinks. 0.010 in. off their mounting surfaces. Replacement sensors have been shortened and don’t require shimming. The CMP for mid-1994 to 96 models carries International part number C92 F7TZ-12K03-A, and can be recognized by the tin-coated connectors. The latest C98-F7TZ-12K073-A version features gold-plated connectors, which gives one an idea of the problems associated with these units. And while the newer CMP has better reliability than the previous type, its gold connectors present an electrolysis problem when mated with the tin connectors used on early 7.3L production. Replacement sensors cost about $100 from International. It's good insurance to carry a spare. The CMP mounts on the front of the engine, adjacent to the camshaft, and is secured by two 10-mm bolts. Trouble code 0344 will be flagged if sensor response is intermittent; 0341 means that enough electrical noise has been detected to affect engine operation. Check connectors for loose, bent, or spread pins and clean grounds. Code 0340 indicates the absence of a sensor signal while cranking. In this case, the engine won’t start. Now in its sixth generation, DDEC (Detroit Diesel Electronic Control or "dee-deck") was the first EMS designed for heavy-duty diesels. Later versions follow European practice by incorporating VGT, large amounts of EGR, and exhaust after-treatment. As described in more detail in Section 9, VGT generates boost across the whole rpm band. It also enables large amounts of exhaust gas to be recirculated under load, when EGR is needed most. Exhaust after-treatment traps particulates and converts oxides of nitrogen, which are smog precursors, into nitrogen and water. The complexity of later DDEC systems and a design philosophy that ties the product closely to service facilities severely limits what can be done without access to factory documentation and a DDR/DDL (Diagnostic Data Reader/Diagnostic Data Link). What follows pretty well sums up what a nonfactory technician, armed with a volt-ohmmeter and a generic J 1587 data-link scanner can accomplish. TBL. 5 lists Detroit Diesel nomenclature. • VGT vane position Flash and PID codes are listed in TBL. 6. If the injector is to be reused, carbon accumulations can be removed from the nozzle body with a wire brush, emory paper, or Scot-Bright. But keep abrasives clear of the nozzle orifices. Using a hand-held brush-not a power tool-clean carbon from the sleeve and vacuum up the particles. This procedure reduces contamination of the drilled fuel passages. Internal fuel galleries must be flushed before starting the engine. Prime the fuel system and, with the key "off," disconnect the ECM at the fuse box or harness connector. Remove the combination check valve and pressure regulator, which are located at the rear of the cylinder head at the return-line elbow. Connect a hose to the gallery outlet, and crank the engine in three 15-second bursts, allowing ample time for the starter motor to cool between engagements. Once the galleries are flushed, replace the regulator, make up the fuel-return line and connect the wiring harness to the computer. Run the engine up to operating temperature and check for fuel leaks. Detroit Diesel supplies an upgrade kit (PN 23528939) for Series 50 and 60 injectors that consists of a spring 11-mm longer than the original, a cam-follower retainer and new hold-down screws. Apparently, the original springs allowed injector plungers to "float" at high rpm. Remove the rocker-arm assembly, place it on a clean surface, and, working with one injector at a time to avoid mixing parts, remove the two 5-mm Allen screws that secure the follower retainer. Lift the retainer and the follower free ( FIG. 26). Clean the parts in diesel fuel, and install the new spring, follower and retainer, using the screws provided in the kit. Torque to 25-28 N-m (22-25 lb-in.). • No voltage to the injectors. With the ignition "off," remove the rocker covers and disconnect the ground-return wire 619 or 620 (shown back at FIG. 24B) from one injector. Make up a 6V test lamp between the ground wire and an engine ground. 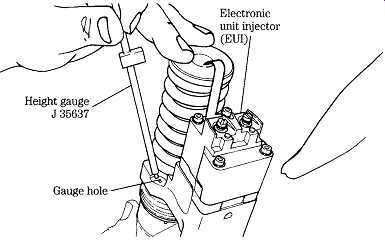 Crank the engine to verify that the injector receives voltage. Reconnect the lead and repeat the test for each of the injectors. • Malfunctioning synchronous reference sensor/timing reference sensor. The SRS/ TRS provides the timing reference necessary to initiate and time injection ( FIG. 27). Flash code 41 indicates that the TRS signal is missing or that the SRS generates phantom pulses. Check the security of the sensor mounting and the pulse wheel for chipped teeth or other damage. The air gap between the TRS and any pulse-wheel tooth should be .020-.040 in. Verify with a depth micrometer and adjust sensor position as necessary. Each sensor has two leads, which should be checked for opens or shorts. The variable geometry turbocharger and the exhaust gas recirculation system are intimately related, with overlapping trouble codes. Depending upon its J 1587 addendum, flash code 48 translates as low air, fuel, or EGR pressure, or as low EGR, turbocharger inlet (TCI), or turbocharger outlet (TCO) temperature. A very low level of fuel in the tank or restrictions in the fuel supply lines generally account for loss of fuel pressure. EGR pressure is sensed upstream of the turbocharger. Consequently, low EGR pressure comes about because of leaks in exhaust tubing going to the turbocharger or because the EGR valve sticks open to pass more than the normal volume of exhaust gases. FIG. 28 illustrates the VGT turbo, EGR valve (7) and the tube-and-shell EGR cooler (1), which is distinguished from the earlier tube-and-fin type by its rounded contours. The newer, more efficient cooler can be retrofitted to earlier Series 60 engines with kit PN 23533985, an operation that calls for reflashing the computer on DDEC IV engines built before 06R0755298. The hydraulic EGR unit must be extracted from the original cooler and pressed into the replacement part. Kent Moore supplies special tools for these operations, although press fixtures and a suit able extractor are not difficult to fabricate.